We'll be happy to supply you! We are a global exporter for used tyres and will be happy to deliver container loads of tyres from Germany to your doorstep. 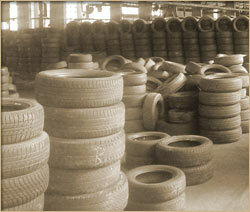 In our sorting facility in Muehlhausen, we keep numerous used tyres and carcasses in all kinds of qualities in stock for you. Moreover, our own HGV fleet ensures a smooth transport on schedule. We'll be happy to provide you with a detailed quotation! Simply get in touch with us - Order our current sales list! A qualified team will be happy to assist you.